Economics Essays: Should we worry about national debt? Governments have been borrowing for centuries. The figures for national debt are staggering. In the US, National debt is over $11 trillion. In the UK, debt is over £1.1 trillion. From a personal perspective, we are brought up to believe debt is a bad thing, and therefore it often feels worrying that national debt can be so large. But, how much should we worry about these levels of national debt? Furthermore, national debt has been much higher in the past. During the Second World War, the national debt of the UK and US, reached very high figures of over 150% of GDP. In the UK debt in the late 1940s reached over 200% of GDP. This is an example, of how a country can borrow during times of a national crisis and pay back the debt over a period of time. National debt can be an effective way to deal with economic shocks such as recessions, financial crisis and world wars. It is worth bearing in mind that in the 1940s, as well as paying for post war reconstruction, the UK set up the NHS and welfare state. There was no austerity panic in the 1940s! The high government debt levels of the 1940s and 1950s were not a barrier to the post war boom years of the 1950s and 1960s which saw record levels of economic growth. Therefore government debt is not necessarily a barrier to economic growth and prosperity. But, it is also important to point out that there is no guarantee that borrowing 150% of GDP will always lead to two decades of economic prosperity. The UK nearly went bankrupt in the late 1940s, and was saved by a loan from the US. see: Why could UK borrow so much in the 1940s, and could we do the same again? It should also be remembered UK debt as a % of GDP fell from 200% of GDP to 40% of GDP (over a period of 40 years) - despite rarely having a budget surplus. An analogy. When I took out a mortgage loan of £140,000, I was left with mortgage payments of £800 a month. In 2004, this was nearly 40% of my income. However, if my income increases by 3% a year. In 20 years time, it will be much easier to pay that mortgage payment of £800, it will hopefully be 15% of my income. To buy a house, it makes sense to borrow a mortgage and pay back over 30-40 years. 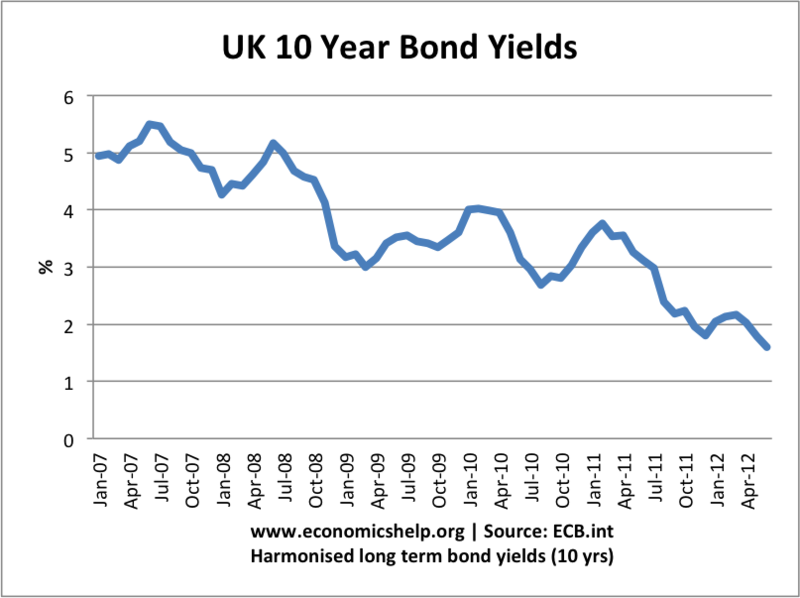 Does higher borrowing cause higher bond yields? In other-words as debt rose, borrowing costs fell. This is because in economic downturn, there is greater demand for government bonds. 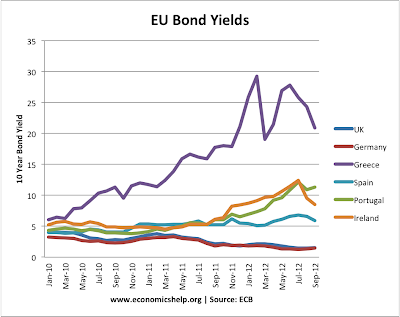 In some cases (such as Eurozone economies) higher levels of public debt pushed up bond yields. Higher bond yields are damaging to the economy. It increases the cost of debt interest payments and is a reflection investors are nervous about the liquidity of government debt. 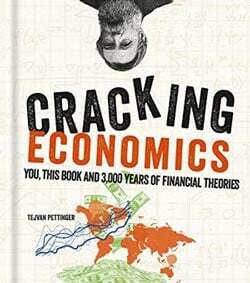 It forced the economies into austerity which caused a prolonged recession. Countries with their own currency and Central Bank (e.g. UK and US) have the ability to purchase bonds and ensure liquidity. In the UK, the sharp rise in government debt between 2007 and 2012, led to a fall in bond yields. 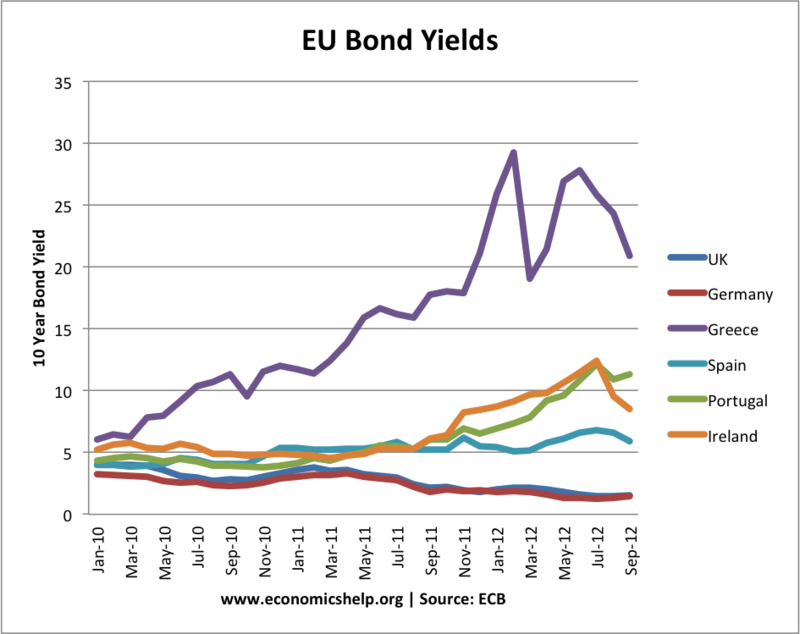 This shows that higher borrowing doesn't have to translate into higher bond yields. Why is there greater demand for government debt in a recession? 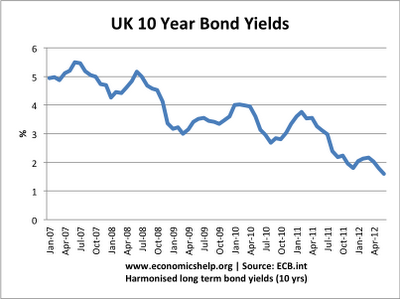 The UK has seen a fall in bond yields during the recession of 2008-12. This is because, in a recession, private sector saving rises. Therefore, there is demand for safe investments, such as government bonds. In a recession, people don't want to take risks, therefore demand for shares and private investment tends to fall. In a recession, government borrowing doesn't tend to cause crowding out. Government borrowing is merely mopping up private sector saving. From a Keynesian perspective, government borrowing can help to boost aggregate demand and offset the fall in Aggregate Demand. In a recession, borrowing can provide a boost to economic growth and therefore, help improve tax revenues. 1. Structural deficit. If government borrowing reflects a fundamental dis-equilibirum between spending and tax revenue then this may lead to unsustainable debt levels in the future. 2. If borrowing is to finance welfare payments with an increased level of dependency. Paying pensions and health care to an ageing population, will do nothing to facilitate economic growth and improve tax revenues, and it will become more difficult to finance the national debt. Some are concerned that countries like Japan have a high debt (over 220% of GDP), but also a rapidly ageing population which will put even more pressure on Japanese debt levels. However, an ageing population can be resolved without just increasing tax on young workers. The retirement age can be increase to keep the same% of population in workforce. 3. Inflationary Pressure. There is a concern that higher levels of national debt can cause inflation. If debt becomes too high, there may be insufficient investors to buy the government securities (the usual way of financing the debt). Therefore, the government may be tempted (or forced) to fill the shortfall in revenue by printing money. Printing money and increasing the money supply, will lead to inflation. The problem with inflation, is that it devalues the value of bonds, people will sell bonds, leading to higher interest rates on bonds and higher debt interest payments. If investors see inflation is getting out of control, people will not want to hold bonds. Foreign investors will sell their securities and this will cause a devaluation in the currency. This is particularly a problem for the US, where foreign countries hold a high % of the national debt.The hyperinflation of Germany in 1922-23 was caused by the government printing money to finance reparation payments to the allies. However, it should be pointed out, this hyperinflation is quite rare and only occurs if the government prints money recklessly without regard to the fundamental economic situation. Quantitative easing in 2009-12 didn't cause inflation in the UK and US. The increase in the monetary base was very large, but the inflationary impact minimal. - Inflation and quantitative easing. 4. Crowding Out. It is argued that if government borrowing increases, it will cause crowding out of the private sector. If the private sector buy bonds it means the private sector has less funds for private sector investment. Also, if borrowing increases, interest rates may rise. Higher interest rates also reduce private sector spending and investment. 5. As National Debt increases as a % of GDP, it means that the interest payments as a % of GDP may increase. Therefore, higher levels of taxes have to be spent on just financing the national debt. Conclusion - should we worry about government debt? It depends when and why the government are borrowing. In a recession, with a fall in private sector demand, a rise in government borrowing is beneficial for maintaining aggregate demand in the economy. If private sector spending fell and we also tried to reduce government borrowing, we could see a precipitous fall in aggregate demand, and a deep recession. See: Austerity can be self-defeating. If the government is borrowing to finance public sector investment, then this can lead to improved economic growth and better tax revenues in the future. When should we worry about government debt? If the government increases debt during a period of economic growth - the higher borrowing is likely to crowd out the private sector and lead to a decline in private sector investment. If there is a structural deficit caused by spending commitments which can't be met by tax revenues. If the government responds to higher debt by printing money; this can cause inflation. e.g. case of Zimbabwe, Germany 1920s. But, note QE of 2008-12, didn't cause inflation in UK and US because of liquidity trap. Well writen and lucid. Keep this record up. Cheers. What would a scenario be for a country without any national debt? Is there any country like that? Or likely to be? Maybe the Vatican City (if that counts as a country). Or some principality like Lichtenstein. - very small and very rich. Or maybe some rich oil producing country like Qatar. I think it is unlikely, you don't gain popularity by abolishing the national debt, you gain popularity by cutting taxes and increasing spending. "If debt becomes too high, there may be insufficient investors to buy the government securities (the way of financing the debt). Therefore, the government may be tempted (or forced) to fill the shortfall in revenue by printing money." I thought the government 'sells' the central bank buys and creates 'money' in the governments account anyway? `the central bank then creates more 'reserves' to loan to commercial banks with a lower rate of interest. National Debt makes sense. If a government was £80 billion in the black they would be criticized for not spending that money on those who could really use it. And there is no sense in keeping national debt hovering at around zero; buy a new hospital ward one week, a tank the next, then maybe put the next few months spending into a new university. A government that develops and improves all services at the same time, and in meaningful measures, is going to build up national debt but it is the only way to do things. Why does a rising public sector debt burden ( debt interest as a proportion of GDP) cause an intergenerational shift of disposable income to the present generation from future ones when gilts are held in the UK? The holders will benefit from interest payments just as the taxpayer has to pay them, so these payments offset. What proportion of gilts are held abroad? Yes there are countries with no national debt. Jersey the largest of the channel islands has no national debt, infact it has a surplus of approx £750 million pounds. It also has one of the highest ranking Human Development Index's in the world. The last HDI report for Jersey in 2009, based on 2008 data, ranked the Island at 0.985 which ranked it as the second best place to live in the world after Norway, during that year. However it may infact be rank 1 now as Norways 2013 rating is now just 0.955. That being said Jersey is a british crown dependancy so any crisis affecting the UK pound would likely have a significant impact. "national debt is just a way to spread national output amongst different generations." There is no net intergenerational transfer unless the debt is external/foreign debt. It affect the distribution within each generation but there is no net transfer. "a debt inherited from the past is, in effect, simply a rule requiring that one group of people — the people who didn't inherit bonds from their parents — make a transfer to another group, the people who did. It has distributional effects, but it does not in any direct sense make the country poorer.